Sierra Leone president Ernest Bai Koroma has launched the construction of a major Highway in Sierra Leone at a cost of US$117.3m. The Bandajuma-Gendema Highway construction project passes through Bandajuma Sowa, in Pujehun District. The highway project will link Liberia and Sierra Leone. Besides, the project is described to be the largest European Union (EU) project ever commissioned in Liberia. President Koroma also kicked off the construction of a 32.8km Moyamba Junction – Moyamba township road alongside four bridges which are Gbangbama, Magbele, Mabang and Moyamba Bridges at Moyamba junction. The bridges will connect the north- south and the west. The connection is also expected to boost the economic growth in the regions. The president also noted that apart from the launched road projects, his administration also has a clear direction with priorities on health, education, infrastructure, energy, agriculture water and sanitation. The World Bank, African Development Bank, the EU together with other development partners are confident and willing to support the government in executing the proposed projects in the country. 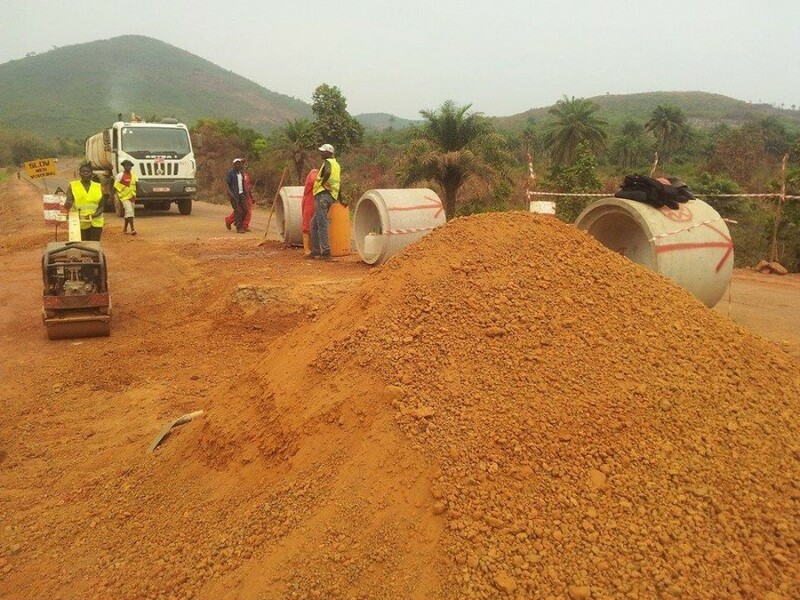 The EU withdrawn its support from the construction of phase I of the Songo – Moyamba, Lumley – Tokeh, and the Rogbere – Guinea border roads. However, according to President Koroma, it took his government 18months to revive the country’s battered agreement with the EU by fully replenishing their funding at the Sierra Leone Commercial Bank. Hon. Alhaji Ibrahim Kemoh Sesay, Minister of Works, Housing and Infrastructure expressed gratitude to the EU for partnering with the government in constructing the 86km Freetown – Conakry road, 24km Freetown – Rogbere road and 162km Freetown – Bo road and now Bandajuma – Liberia road respectively. Sierra Leone government has acknowledged the importance of the road network and is working indiscriminately across the country and for the national character of his leadership. Additionally, Kuwaiti government has assured its support towards the Hillside bye-pass road. Amadou Gaye, the CSE Country Manager, noted that, the 103km road project which includes the construction of the three bridges is expected to be delivered within a period of 24 months, though he assured that the project will be completed within the scheduled frame time.